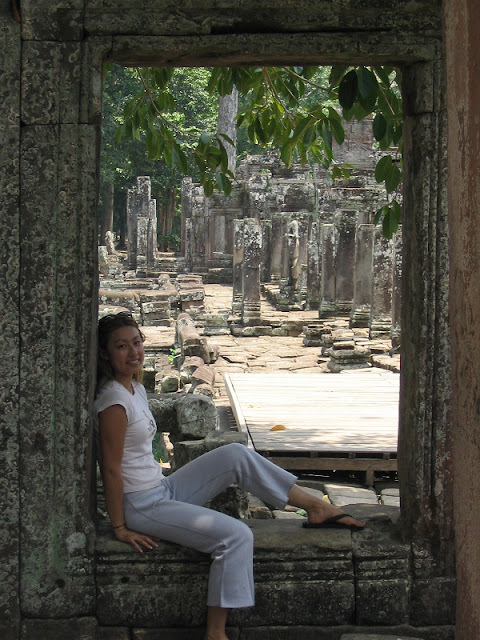 A few years ago, a vacation to Southeast Asia turned into an unexpected cultural discovery. Geoff, my boyfriend then (now my husband) and I took a trip to visit his old university friend who left his finance job behind to open the first back-packers cafe in the main city of Phnom Penh! 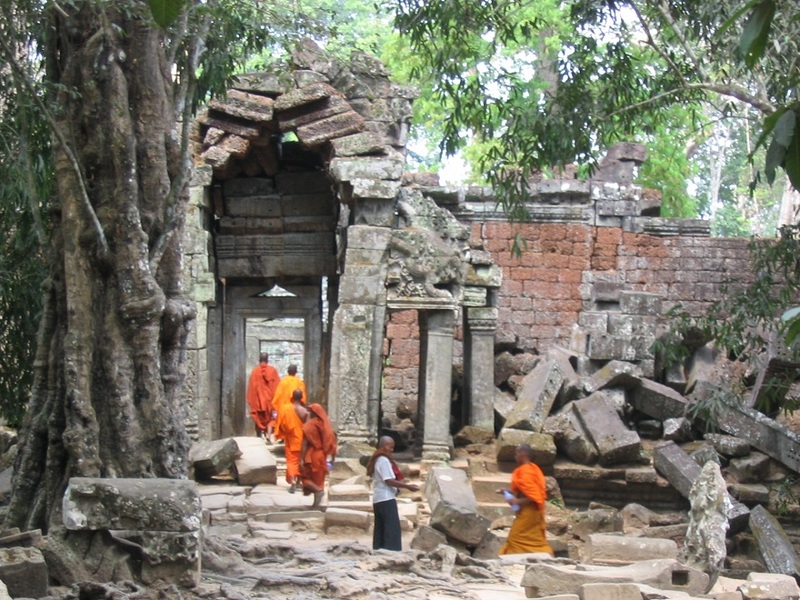 In mid-2000, Cambodia had a bad rep for being a dangerous war-torn country, full of land minds (watch where you step) and was not exactly the tourist hot spot it has become today. It was one of those off-the-beaten path, adventurous things you do to give your parents a heart attack! The trip to Angkor Wat is one of the most talked about routes. Yes, there are plenty of taxi scams and visa rip-offs but with proper planning it's pretty straightforward. There are options to go by bus or boat but I recommend flying, you pay a bit more but will save time and hassle. (Fyi: I chose the bus, it took 8 hours and the a/c broke! I ended up getting there in one piece but got very sick.) 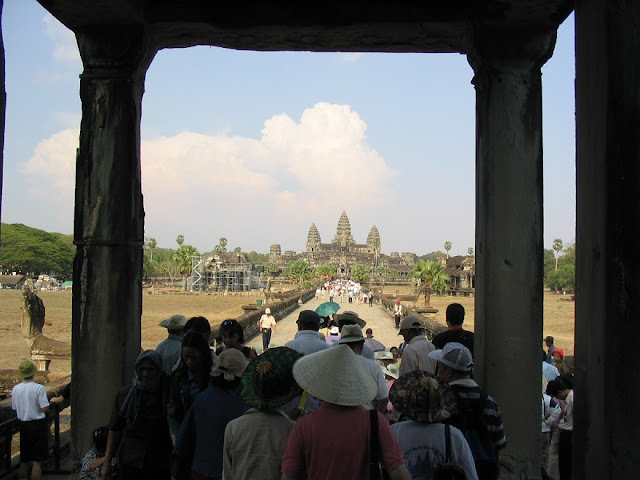 Book your flight to Siem Reap Airport and don't forget to purchase a Tourist Visa there for $20. Upon arriving, I expected to immerse in a culture completely different from mine but I didn’t expect to feast my eyes on something so grandeur, historical and breathtaking! The Tomb Raider movie just didn't do justice to this...! 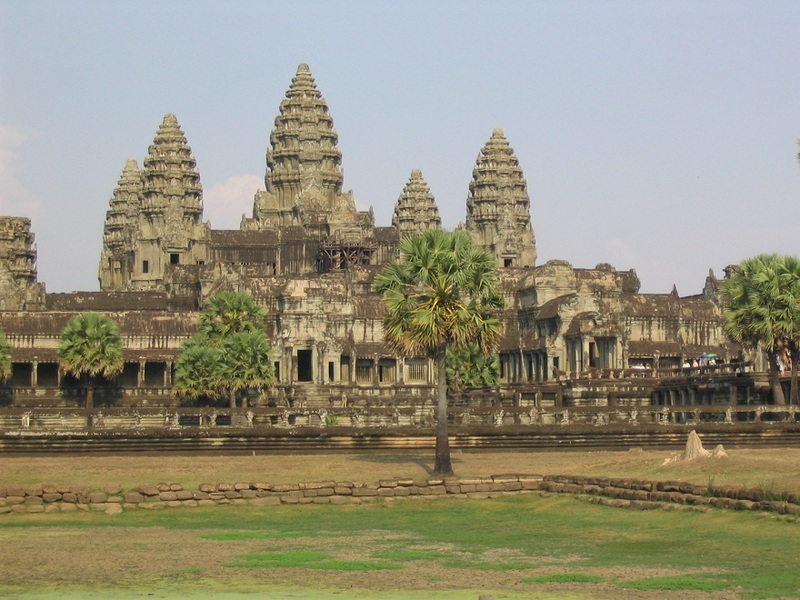 Angkor Wat is a temple located in the northern province of Siem Reap and is recognized as the largest religious structure in the world. (It is HUGE alright so I recommend staying at a nearby hotel and budgeting 2 days for this attraction.) It consists of five main shrines, a moat, three galleries and over 200 acres of mind-blowing beautiful ruins. Until you are actually there, you don’t even realize the magnitude of this ancient site and the complexity and uniqueness of each structure. Angkor Wat translates to “city temple” and reflects the classical style of Khmer architecture. It is also part of the 7 Wonders of the World! 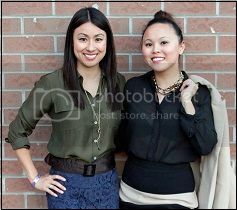 Our day started early (6am)! I'm not a morning person but believe me, it's worth losing sleep in order to cover enough ground, avoid the tourist rush and beat the intense 40+ degree celsius heat (I was there in April). For $30 or equivalent to approximately 120,000 riels (talk about inflation), we hired a guide - his name was Casanova and he drove us around in his colourful tuk-tuk. (Tip: better to use US dollars than Cambodian riel). 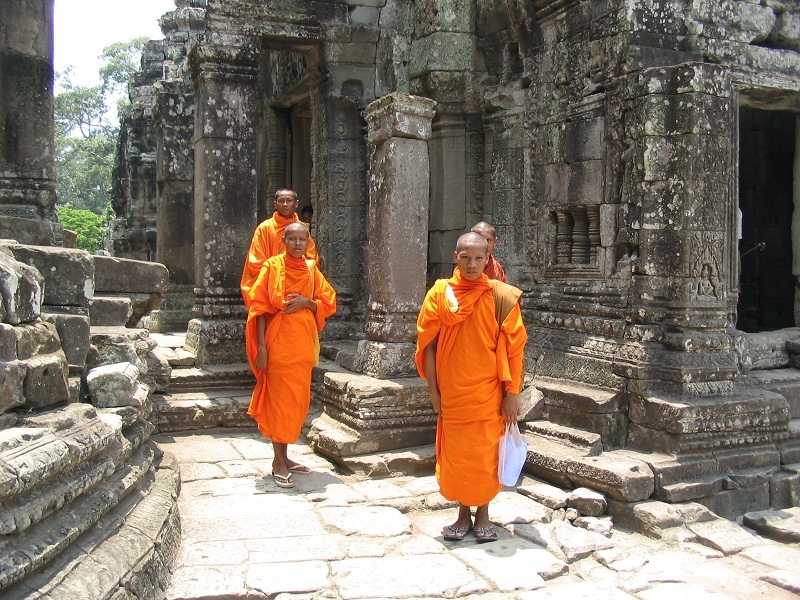 The first stop on the grand circuit tour was Angkor Wat itself, the biggest and main temple. I felt like I was in a maze – at times you were underground admiring the intricate wall carvings and other times, you were hiking up steep staircases to reach the soaring towers. Every corner turned was another photo opportunity! (Tip: make sure your camera battery is fully charged and you have at least a 4 GB memory card for photos and videos). Often when you are surrounded by such richness of history you forget you are still in a developing country, so you have to be careful because you will be approached many times by children asking you to pay to take photos or to try to sell you water and postcards. It's hard to resist a bunch of cute faces asking if you can “spare fee dallahs”? What I ended up doing was buying a bag of candies and pencils at the souvenir shop and handing those out instead. After a delightful lunch at the on-site restaurant, we continued onto Angkor Thom, a walled complex surrounding Angkor Wat. It is noted by the “bayon temple” which is easy to spot since there are hundreds of stone faces carved into the rocks. I marveled at every detail, wondering how long it took to create such masterpieces and how skilled one must be back then with limited tools. When I reached Ta Promh, I swore I’ve seen it before! Made famous by Lara Croft (aka Angelina Jolie), it was the destination where Tomb Raider was filmed! 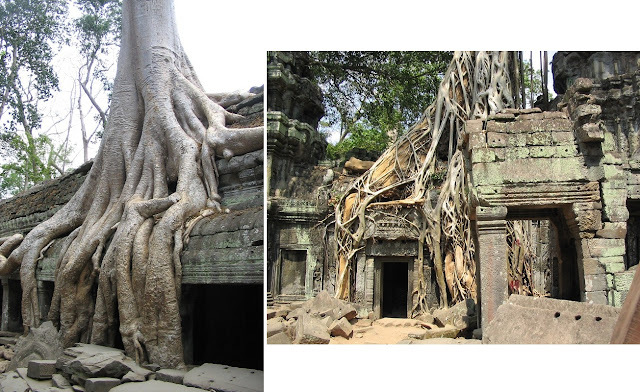 You can recognize it immediately from the giant twisted tree roots growing right out of the ground and draped over the rooftops of the temple. Wow, the wonders of nature! There is so much to see here and this is only a small glimpse of my adventures. While I continue to travel to far-off exotic places, I have yet to find another place that has captivated me as much as Angkor Wat. Definitely add it to your "Before 35" or "Before Baby" Bucket List! I travelled solo to see Angkor Wat several years ago & it is definitely a sight to see! It's truly a breathtaking experience. 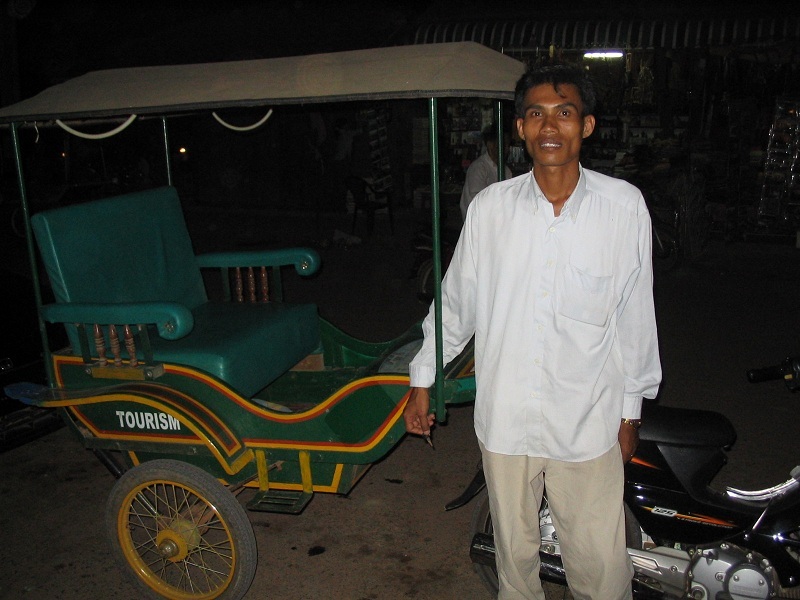 My favourite way of getting around was by tuk tuk. I also "hired" a driver (named Ou Hok) for the week that I was there, he was amazing! I'm really glad my friend Juan (who tragically died in Phnom Phen in a motorcycle accident shortly after this trip) convinced us to visit this beautiful country. 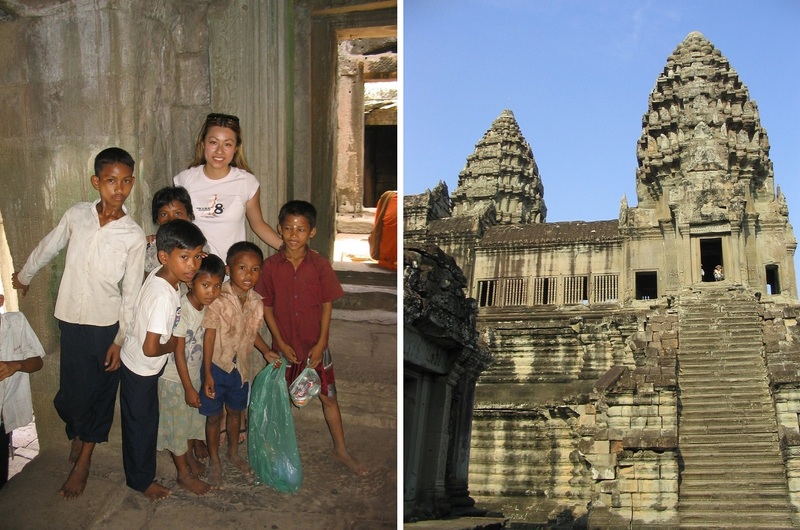 Back in 2004, tourism was a much smaller industry in Cambodia, so we got to see it at a very unique time. The spirit of the people is impossible to really capture on camera, but we did our best. You will love this experience, so put it on your list of things to do!